Life is a rollercoaster. There are highs and there are lows. There are ups and there are downs. There are good days and there are bad days. And there are hundreds more cliches that share the same sentiment. I, for one, cannot complain. Over my 28 years, there have been some truly stand-out moments but each exceptional moment I recall is, by and large, separated by a few years. By no means is this something to lament. No-one’s life is day-to-day excellence and stand-out moments are not altogether terribly common. But Gay Pride in Amsterdam was exceptional. ‘Yesterday was so good,’ one of our Dutch friends reflected longingly as he shovelled a chunk of syrupy pancake into his mouth. ‘I wish we could go back to yesterday…’ another friend replied, taking a big gulp of her coffee. This was Sunday 6 August and we were huddled around a table at The Pancake Bakery in the centre of Amsterdam. In the midst of our hangovers, we were reminiscing about the day before and that longing was a feeling we all shared. These Dutch friends had told us there are a few major events on their calendars each year. The biggest day of the year by far is King’s Day, a Dutch national holiday dating back to 1885, but their favourite celebration is Gay Pride. 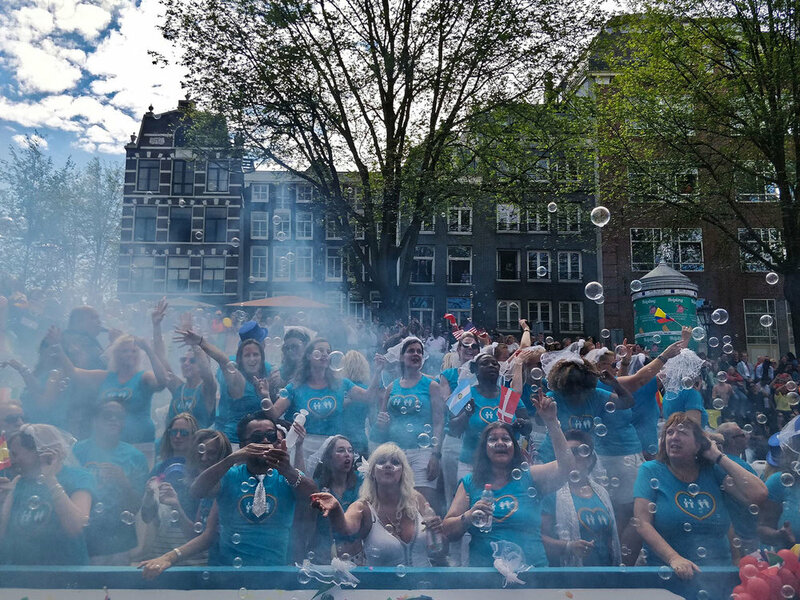 Amsterdam has a proud history of supporting its LGBTQI communities and Gay Pride is a celebration that the whole city takes part in. These Dutch friends had whipped us up into a fervour as we made our way into the centre of Amsterdam -- this was going to be a day to remember. Shouldering backpacks filled with snacks and beverages, we took the tram into the city centre and started walking toward our meeting point on the Prinsengracht canal. The sun shone brightly and Amsterdam was truly beaming, but the streets were deserted. The footpaths were devoid of tourists, the bike paths were sans bikes and the city itself had fallen silent. But as we drew nearer to the Prinsengracht canal, we spotted others heading in the same direction. Eventually, the crowds thickened as the sounds of chatter (and a distant EDM beat) grew louder. As we opened up onto the canal, we found where all the occupants of the city had disappeared to. Thick crowds lined all sides of the canals and bridges and, squeezing through the sea of cheerful, glittery faces, we could feel the excitement catching. Their collective joy was palpable. It wasn’t long before I noticed a smile plastered across my face to match the countless smiles around me. It was heart-warming simply to be there amongst it all but our Dutch friends had a special surprise in store for us. Not only were we to watch the parade -- we were to watch the parade from a boat on the canal. We squeezed our way along the path and slowly edged to the very front of the crowd. With great difficulty, we lowered ourselves onto the boat just as the first of the Gay Pride Parade’s floats passed by. 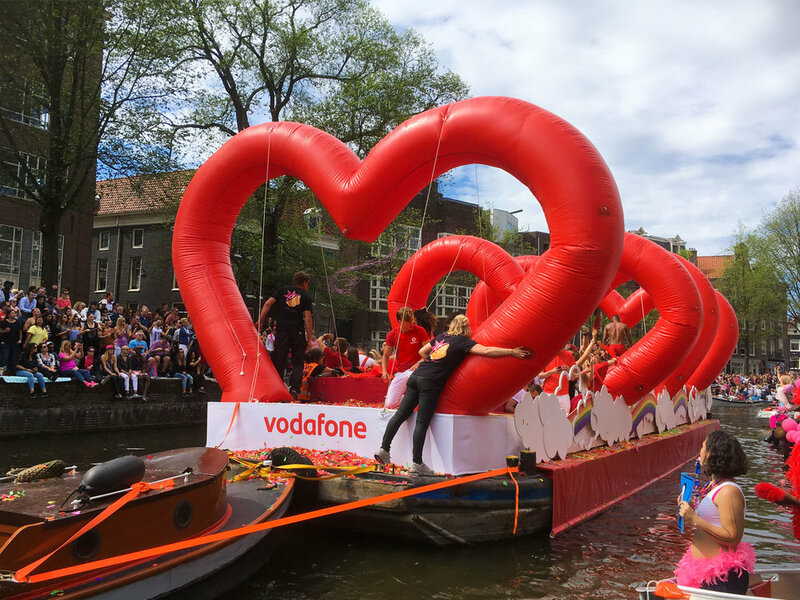 Not a city to do ordinary things, Amsterdam’s Pride festival actually takes place in its canals. The parade is made up of a series of lavishly decorated boats making their through the city centre. From the deck, we could see countless other excited spectators singing, dancing, drinking and cheering from their own boats. As we looked around at everyone gathered together to watch the Gay Pride floats parade down the canal, we could see there was a lot of love for this day. Each float passed by with a dance, a song, several blown kisses and a message. Each message contained one core idea: equality and acceptance for all. Most floats were a pure celebration of love and individuality, while others reminded us of the sad realities LGBTQI communities around the world still face. As each float passed, we felt their message -- we felt the joy and we felt the sadness. But what made the day so special, so unique and so heart-warming was the knowledge that we stood together. Lesbian, gay, bisexual, transgender, queer, intersex, straight - we were all united under the belief that love is love and that equal rights are deserved by all. It was this knowledge that filled our hearts with pure joy. It was what made the day exceptional. I wish I could make you feel how I felt, or even show you what that joy looked like. But I think this gif of my girlfriends gleefully skipping down the street while searching for a bathroom is the closest I might get. 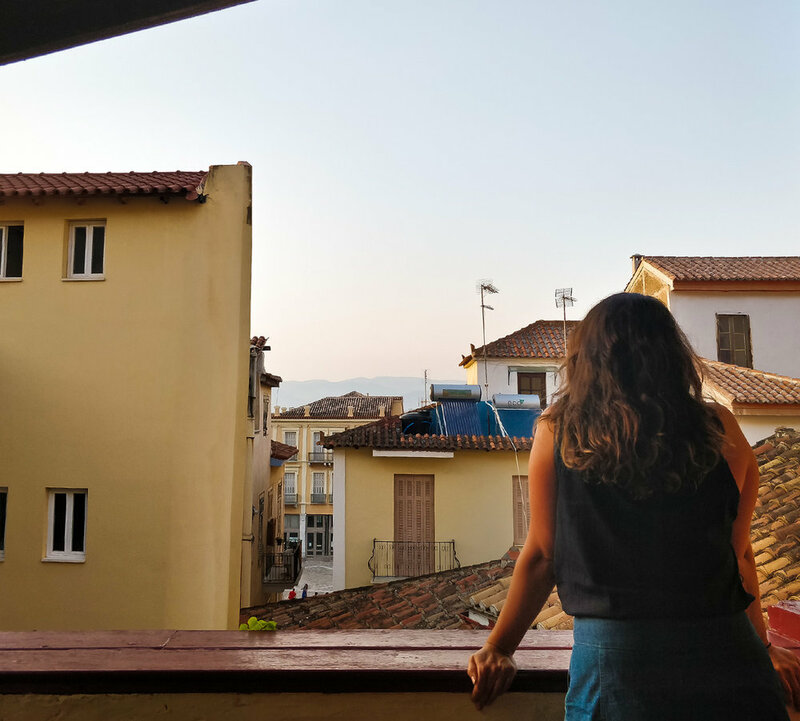 Sep 22 Athens - Eat, Drink, Sightsee, Repeat.